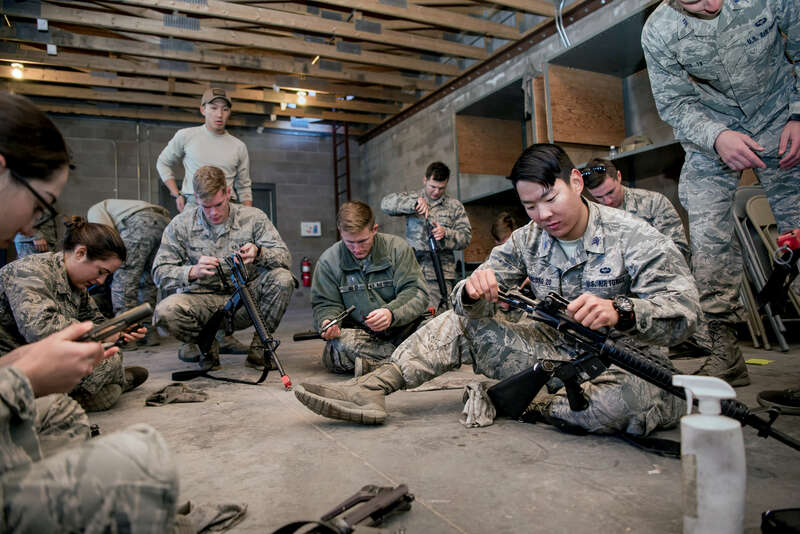 AIR FORCE ACADEMY, Colo. — Cadets took a one-day break from classes to focus on their military training during the annual Commandant’s Challenge Oct. 12. All 40 cadet squadrons squared off against each other in a series of scored tasks that included intelligence, security and air support. The 13th Air Support Operations Squadron at Fort Carson provided experienced Joint Terminal Attack Controllers to mentor the cadets. “Building joint leaders is one of Air Force Chief of Staff’s key objectives, and we’re a big part of that as we develop and graduate our leaders into the Air Force. It was a tremendous opportunity to bring the [JTACs] here to give the cadets operational relevance,” Campbell said. According to Cadet 1st Class Jonah Whitt, one of the event’s planners, it was also the first challenge to incorporate the Academy’s RPA assets. “We tried to incorporate the different facets of war and contextualize a scenario where we were an expeditionary force and assess things that we have been trained on,” Whitt said. Whitt said the experience of planning such a large-scale event had stretched him as a leader and gave him a deeper appreciation for training or mission intent. Whitt said he was proud of his planning team, and he hoped the training would continue to evolve and improve for future challenges. “We’re trying to live the spirit of innovation here,” he said. Cadet Squadron 16, the “Chickenhawks,” placed first in the challenge, Cadet Squadron 08 finished second, and Cadet Squadron 29 rounded out the top finishers in third. “A big part of our victory was that early preparation. We got on it weeks before, we had a plan, and we executed that plan throughout the week and today,” said Cadet 1st Class Caleb Mathes, CS-16 squadron major events training officer.